See OngoingGame for best practices. We are making a list of players, one for white, one for black, and sort of pick "teams". That way, we won't have one player playing both sides, and it will be a bit more competitive. Migeru this looks like fun, and white is next and short one player. If you want to join in, just add your name to the color you're playing. LukeNine45: . Give white a life and death problem. HowardC: - Trying to do two things with one move. steveurick: . Please insert comment here. ChessWhiz: - Let's keep the game moving! HolIgor: . I hope that this move helps a little blacks lonely stone at the top. Migeru : I think white does not need to run any more. Black may make a bunch of points in the center, though. ChessWhiz : Still heavy, still running. HolIgor: . It is important to keep white's stones separated. Migeru : It's been ages since last move. 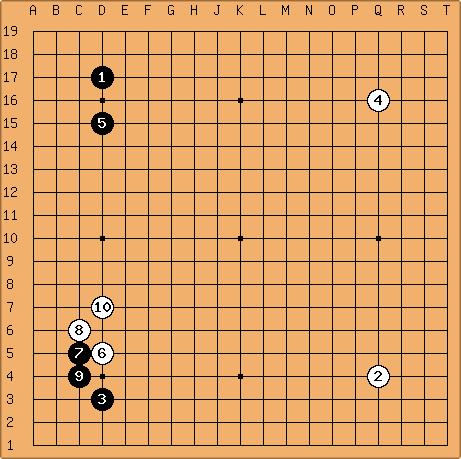 Migeru : It's been a long time since the last move. This seems to be the best place to jump to. Still heavy, though. DJ : I really wanted to play a reckless move, but I'll refrain... Maybe later. Meanwhile, my perception is that increases the heaviness of the white group, which is now a juicy target for attack: also because of the weakness at a, I think it will be a tough fight for White. Migeru: . I think this is mandatory. L3 and Q16 are ladder-breakers. HolIgor: . Trying to create a weak group in white's ranks. ChessWhiz : Helping to defend the corner. It's been quite some time since I last made a move! Hope it is not a too bad one! Migeru . Let's not be intimidated. HolIgor: . Let's imagine that we are playing a handicap game. Jesse: . I'm ready for someone to tell me that a was better. Therefore I concluded that establishing a black position on the RS was a good thing to do. unkx80: Black 31 will never be played at a and create that empty triangle shape. However, I expected 31 to be played at 32.
: HolIgor: One of the possible black's plan would be to attack those two white's stones. Without reading too much into the posistion I choose 31. Black stones are more or less robust at the left and the stone 31 feels support from the friedly stones around. ChessWhiz: - Extend from attachment, but where? I'll choose this move over c.
DJ : It would be tempting to cut... but Black's shape is thoroughly horrible, bad Aji everywhere. ChessWhiz: - Pressing down and inviting a crosscut. HolIgor: Black has to try to get to the center. Meanwhile, my best wishes to all the players here, may the 2003 bring you two stones stronger! ChessWhiz: You're right, DJ... after 25 moves of this, I can see why having it all on one page is better. Feel free to switch it back. Happy Holidays! Migeru: White 24. This is a bit risky, but I think the aji of the marked white stone allows me to do this. HolIgor: Black 23. Black does not want to be pressed down as Umezawa Yukari sensei was in the final of the Female Strongest title match recently. The stone at 2 has to float alone. Black could choose a faster move like 5 as well, but a solid thick move is OK. Black has to remember also that a nasty aji at f was left behind. Migeru: White 22. I follow the suggestion of Stevertigo in his comment to move 16. He suggests playing at c but I find that invasion a too deep for my taste and skill. I have the impression that d would also be possible, but I am willing to be set straight on that one. As for playing two moves in two days in a rengo, I have seen from the history that there had been no moves made since September. I am just trying to revive the game. Migeru: I would like to know what people think of the more passive possibility of playing Black 20 at a. Should White then sacrifice the marked stone with 3 (which I prefer) or extend at 1? AvatarDJFlux: Dear Migeru, I thought this game had lost interest after somebody played a couple of strange moves for Black without declaring his name. In particular the last one ( ) is plainly a bad mistake. Black not having defended, should have captured at a (b5) and, im my very very humble opinion, the game could have been considered as good as over. But you have used the black team the fair courtesy of allow it to mend such (intentional?) mistake by not taking immediate advantage of the anonymous sabotage, and we therefore thank you! I'll play again, and, who knows, maybe the OGG3 will take off again! Stevertigo: White 18 well. guess White should connect. Stevertigo White 16: I'm wanting to keep sente - Black will pinch, White connects, and Black still has to fix or White will take the lone stone, destroying any territory there. White can then aim at an oba, like b - invading Black's left moyo may seem premature, but considering the strength of the upper left shimari, this would be too much money in the bank for Black. And a probe might be a good idea before, like at x, y or z beforehand. Now the black group in the lower left is in an embarassing situation. And, being while we're at it, how come Black 13 has not been "signed"? ChessWhiz: White 14 - Seems Black 13 has already been played. I'll play White 14 and pull White's fragile position back together. JamesA: OK, White 12 seems a sensible response. However, wouldn't White rather have the more solid connection now than the tiger's mouth? Black has an annoying atari which White will have to think about. I'm not going to play Black 13 - I leave it to another black player to decide whether to play slowly and take the corner territory or whether to cut and fight. Personally, I'd play on top of White 12 and fight, as Black 11 should be more useful in that situation. JoeSeki: I thought about c as well, I thought Black would then peep at the other side of the tiger mouth and make White heavy. JamesA: I would play the normal joseki after White c and hope that the aji left by the exchange of and c would benefit Black. 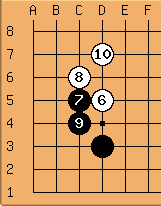 However, perhaps the exchange isn't good at all, which leaves b instead of Black 11 to consider. I think I prefer b now. JoeSeki's idea of peeping at the tiger's mouth seems interesting - perhaps that would be a good way to deal with c.
SAS: Just out of interest, what were you intending to do if White had answered at c? JoeSeki: Black can get out along the left side, but then White gets a big bottom side. Black can get out along the bottom, but then White gets big thickness in the middle. All good for White, I think. I didn't mean it to come out so harshly. I was putting out my thoughts and ideas to be criticized in return. Or be refuted soundly :) SAS said something about playing on the smaller side of the black shimari at the top. I was commenting on completing the joseki first before worrying about big points to play. I felt Black was leaving enough weakness behind that to have a completed position would be far better than just playing big points. But then again unusual play is how I usually end up losing. JamesA: Ouch! Strong criticism for Black 11! Of course I do not think that the tiger mouth is bad, but I do think Black 11 is playable and gives a more interesting game for Black. Perhaps it would have been better at b? Joeseki: White 12 - I liked the tiger mouth connection. Although the left side is smaller than the top, you should not be looking at the size of things when you have a vulnerable group on the board, or one that can be sealed off from the rest of the game. That is, there's a joseki going on in the lower left and it should be completed or there will be big consequences. White 12 should seal Black into the corner, or Black has to accept a loss here somehow. He's playing on the smaller left side instead of the top, he's letting White roll down the side and make the bottom bigger than the top. White should get good thickness facing the middle as well. Patience is called for here, and let the stones' strengths reveal themselves as the game progresses. JamesA: Black 11 - I'll wade in for Black at this point. I don't like to play a peaceful game so let's make it interesting with Black 11. I think this is playable because White has made a tiger mouth which should make any attempt to shut off the lower side slightly less effective. Anyway, I don't feel able to let White play a beautiful point on the left side! SAS: White 10 - I prefer this to the solid connection because it threatens to extend further towards Black's shimari (albeit that this isn't the important side of the shimari). HolIgor: Black 9 - I've played 9 just to make things happen faster. I don't think that Black has a better move elsewhere. It is solid, creates a living group in the corner. The choice of the continuation belongs to White. This move was decided by the choice of Black 7. 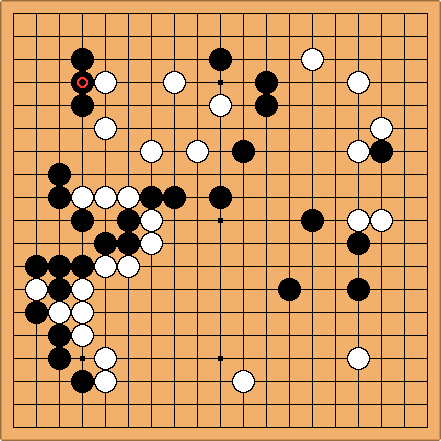 SAS: White 6 - A kakari is the obvious move. I don't know if this is the best one. SAS: - Forms a niren-sei. Black now has only 188 essentially different choices for his next move, compared to 357 after any other White move. Not that this has got much to do with anything, really. AvatarDJFlux: Black 3 - Recently I've grown fond of this kind of opposite komoku. ChessWhiz: White 2 - I've always liked opening on the hoshi.